For all the tea lovers out there, many of us tend to visit tea cafés, tea lounges or even Nukkad Thadis to try out different types of teas. At the end of a busy day, a perfectly brewed cup is all we desire. 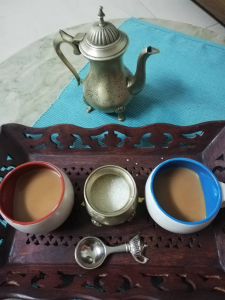 Many of wish to stray from the traditional brews to experience a range of perfectly steeped handcrafted teas with enigmatic combinations of flavours which we are otherwise unable to recreate at home. But, what if you could experience whole leaf, flavourful and healthy teas from the comforts of your own home? We have recently had the opportunity to experience a range of loose and bagged craft teas by DivynTea. Here’s our take on the variety of high quality black, green, white and organic teas curated to match our taste palettes, we tried out. Overall Feel: The perfect tea before bedtime sure to get you a good night’s sleep. Also, helps calm a stressed mind. Made from small pressed Chamomile flowers, this tea was the perfect introduction to Divyntea’s ‘Floral Experience’ Tea box collection. 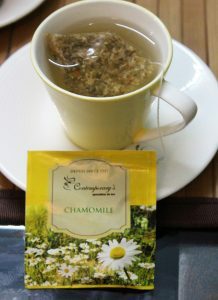 It was pure, fresh and packed with natural flavours of chamomile. The silken pouch encasing the chamomile flowers was a treat for the eyes as well as the tongue. Look: A blend of long and short leaves with Hibscus flower petals. Overall Feel: The day time tea perfect tea to help you relax from a full-packed schedule. Hibiscus is known to lower cholesterol and help reduce blood pressure. Divyntea ensure that the full flavour of the tea shines through, so you experience tea the way it’s meant to be had without any additives. The first thing we noticed was tart sharpness of the hibiscus in the brew. The tea leaves behind a pleasant and refreshing floral aftertaste. 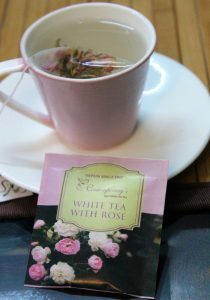 Overall Feel: This white tea blend was a beautiful floral bouquet in flavour with a sweet rose finish. 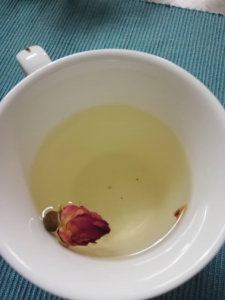 With bright red rose petals, the tea was a sophisticated take on traditional White Tea. The flowers bloom beautifully after steeping and are a treat for the eyes. It is a masterful balance of taste, beauty and aroma. The perfect tea to have for a fanciful afternoon by yourself or at a tea party. Overall Feel: The marigold leaves add an amber glow to your cup. 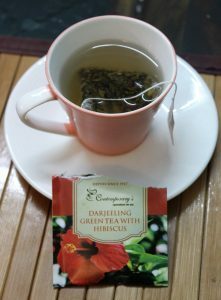 The green tea lends to a very grassy and earthy flavour. This tea is the perfect celebration of festivity. The Marigold petals lend a very balmy and healthy note in your cup. Those who enjoy green tea will certainly love this flavour. 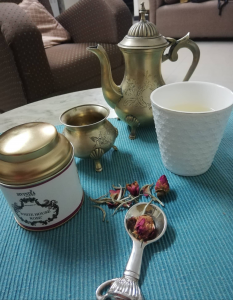 Packed with the authentic spice blend of ginger and cardamom, this tea is sure to perk you up after a long and tiring day. A perfect alternative to handmade ‘Adrak wali Chai’, this tea is the perfect Indian masala tea brew. We had ours with milk and sugar but we can’t wait to try it without, to experience the flavour in its entirety. Overall Feel: This organic white tea is the perfect sip for when you desire a delicate tea pairing with a soothing afternoon. The tea was absolutely stunning with organic whole rose buds which delicately unfurled upon brewing. The sweet heady scent of dried rose permeates the brew. It is a low caffeine blend with a very mild flavour which you will come to enjoy. Divyntea offers the finest whole leaf tea blends crafted in small batches to preserve freshness. Their blend is 100% Pure and has No Artificial Colours or Additives. We were simply blown away by the beautiful packaging of these teas. All their tea bags are heat sealed in silken pouches for security and freshness. The best part about these teas is that they are whole- leaf and have no tea dust. DivynTea is a start-up by Vandita Rungta of Jaipur and Deepika Saharia of Kolkata. With different types of teas and exotic tea blends crafted straight from the tea gardens of Assam, the brand is leading in tea manufacturing, blending and exporting from over ten decades.